Hey friends! It’s hard to believe that it was 4 years ago this month that we moved into this home. If you are new to the blog, welcome! Just to catch you up to speed, we live in a split level home that was built in 1996. The previous owners did some updates to the home during the time they lived here, but some things have not been touched in years. We have kept ourselves very busy updating this home and making it ours, all on a tight budget. I have written a post each year at around this time to show what progress we have made during each year of living here, and if you would like to catch up on those, you can click here, here, and here. Go ahead, I’ll wait! In this post, I am going to summarize the changes that we have made to the house during just our 4th year living here. And believe it or not, there is still plenty more updates to be done in this home! I also want to note that these projects and updates I am sharing today are just a small glimpse of things I have done in this past year, you can see more by clicking my Trashtastic Treasures and my DIY Projects tabs! 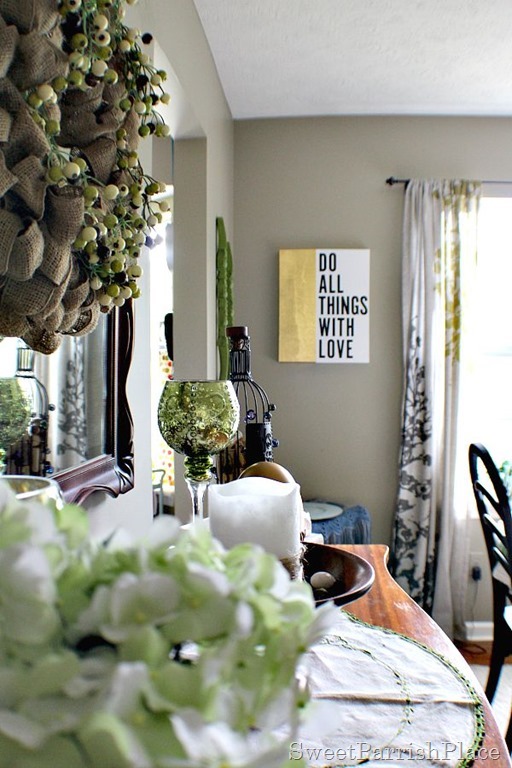 These are just the main things I have chosen to highlight today because I think they fall more into the category of things that have really changed the look and feel of our home. In our downstairs family room, we made a couple of important changes. We moved in a different table to go underneath of our television, got rid of our ancient heavy television, and hung a flat screen on the wall. Then we moved the large TV cabinet that used to house our gargantuan TV over across the room and I utilized it as craft and decor storage. 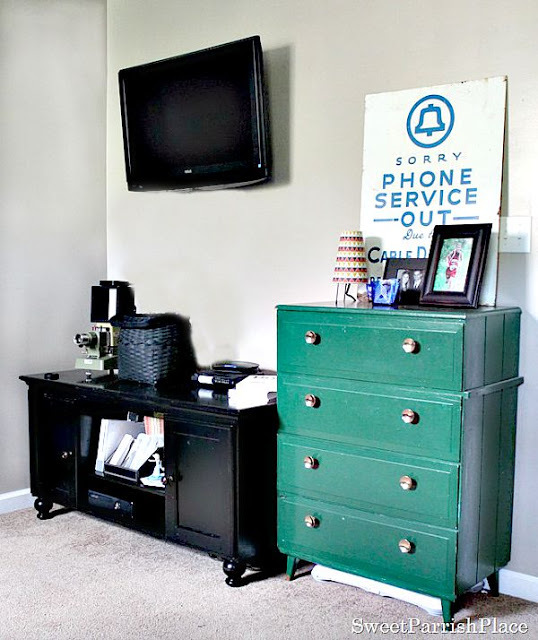 I made over this dresser that you see in the above photo in our family room and utilized it for a gift wrapping station. 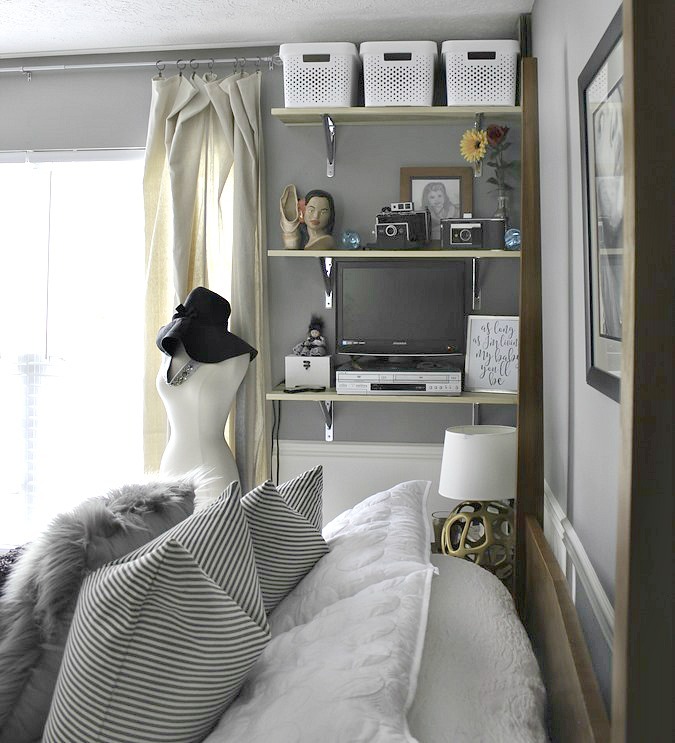 This makeover made such a huge impact in this room! I added new curtains in Mr. 8 Year Old’s bedroom, and showed you how you can hem them the no sew way! This made his room feel so much more cozy! I added a new canvas in the dining room, replacing an old candle holder that I had for years. This gave the room a more modern vibe. We finally replaced our dining room chandelier with a $15 yard sale makeover, and centered it over our table. This is a project I had been wanting to do since day one of moving into this house. And I love the way it looks now! I had been on the lookout for some file cabinets to make over for our dining room/office, and I finally found some and they are being utilized in the space. I painted them, but I still might have something else up my sleeve for them, so stay tuned! I made over the bar stools in our kitchen. I had painted the island already, but had not gotten around to the bar stools yet, so I was happy to mark this particular project off the list. Then we added legs to our kitchen island. And we still aren’t finished with our island update. We plan to add a rustic wood top next! I added a new piece of wall art in the living room. A print my daughter brought home from Sweden to me. I also showed you how I made over the thrift store frame and added a mat using craft paper. We bought a new sectional and a chair for our living room. You can see the old sofa in the picture above. The new furniture is something I had been wanting since we moved in, but we had to wait until we could afford it. So finally having new furniture was HUGE for me! Here’s a fun fact, Ashley Home Store (where we bought our furniture) reshared this on their main page, and then lots of separate local Ashley Home Stores shared it too, so this is one of my most popular Instagram shares ever! A couple of months after we bought the sofa and chair, we also bought a new coffee table. The old leather bench just didn’t go with the new furniture. It now resides in our son’s bedroom. I made a new DIY towel hook for our master bath. And that was just the beginning of several updates we made to our master bath in the past year. We still have two more projects in this room before it will be completely finished. We finally painted our master bathroom. This is another project that had been on the to do list for way too long. I am so happy this room is finally painted! We also hung those bins you see below right after we painted. 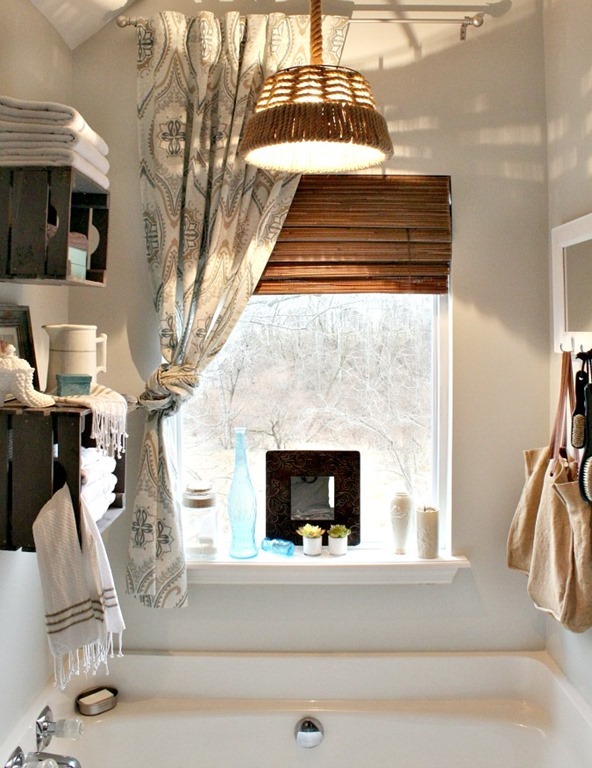 We added a new hanging pendant light in our master bath. A friend I graduated with was kind enough to come over and hang this light for us, and we love the way it changed the room! We added subway tiles over the shower stall in our master bathroom in order to fix and prevent further water damage. We installed a subway tile backsplash and a new over the sink light in our master bathroom. We added a DIY rustic wood accent wall in our upstairs hallway. This is one of my favorite spots in our home now. We moved my daughter’s bedroom upstairs across from ours, and completely transformed the room. 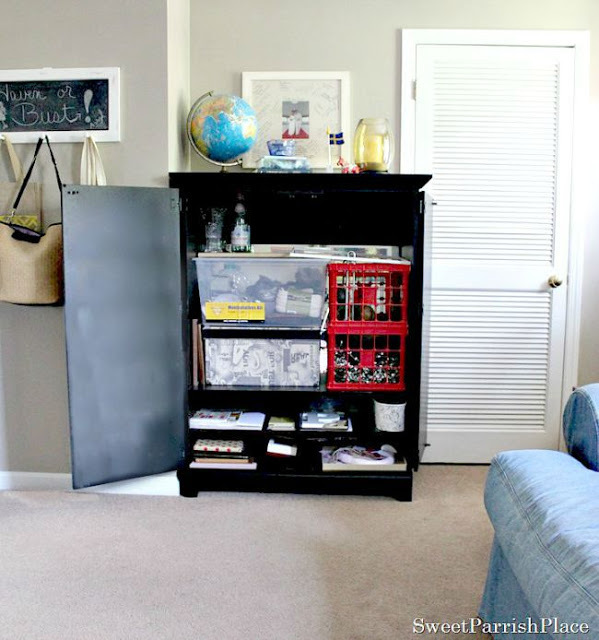 We then added some DIY shelves to her room and drop cloth curtains. We also moved Mr. 16 Year Old’s room downstairs where my daughter’s room used to be, and completely transformed that room. We figured since he lives with us full time, and my daughter doesn’t, he deserved the extra privacy. And so did we! 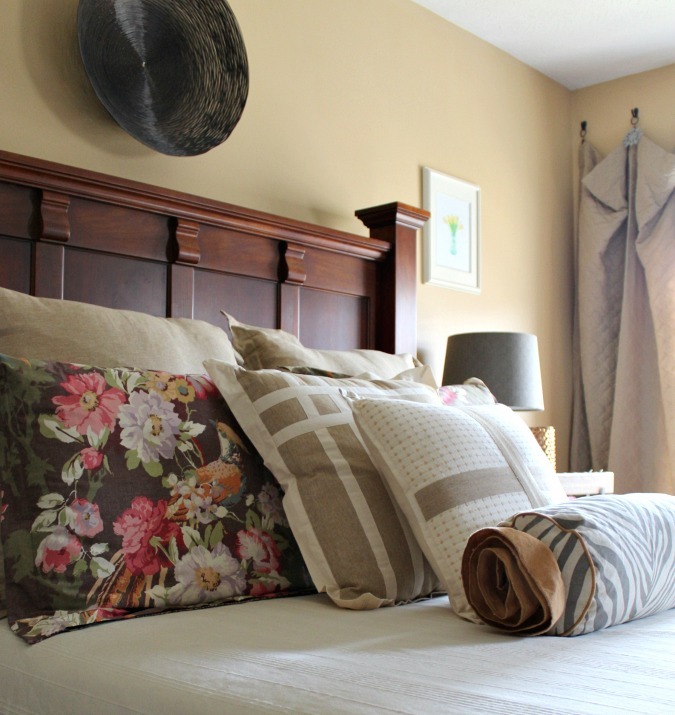 I gave our master bedroom a tiny update with some new pillow shams for the bed. It was a tiny change, but I feel like it helped to introduce a new color pallet to the room. We finally made some progress in our garage, which had not been touched since we moved into the house 4 years ago.We only finished one small corner of the garage, but it did inspire us to do some more cleaning in this space for sure! We have done more purging, but I haven’t written anything further about it yet. That pretty much sums up the major things we did in the house this past year. We are hoping that we will be living in this house for another couple of years at most. But until then, we will continue to update this home and do the best with it that we can. We want to leave this house better than it was when we moved in! Thanks for joining me today for this little update! I am in the middle of updating the vanity in our upstairs bathroom right now. I am painting it and adding a quartz counter top with a new sink, so I can’t wait to share it with you guys! I do post little peeks here and there over on Instagram, so follow me there! 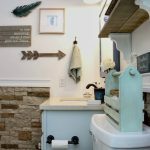 I wanted to complete this bathroom this summer, but it looks like I am running out of time for that, so at this point I will be happy to finish the vanity and sink, and then I will hopefully get the rest done before Fall sets in. Thanks so much for stopping by today, have a great Thursday friends, and please come back soon. What is your favorite change we made this past year? I would love to read your opinion in the comments below. I love your comments,and I read every one!